Description: The Northern Line's power sits in the yard. Description: holding the main in front of the Amtrak Depot. Description: The Northern Lines sits in the yard waiting to head out onto the BNSF Staples Sub. Description: The 1704 heads to the quarry with five side-dumps. 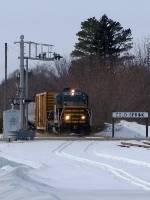 Description: Their work finished, the Northern Lines departs Cold Spring. Description: The NLR highballs through Rockville, MN. Description: The Northern Lines fleet sits idle after the days work has been finished. Date approximate. Description: The East Local sits in the yard, waiting for a crew. Two RLCX locos are in the consist today, starting their journey to Albia, IA. Date approximate.